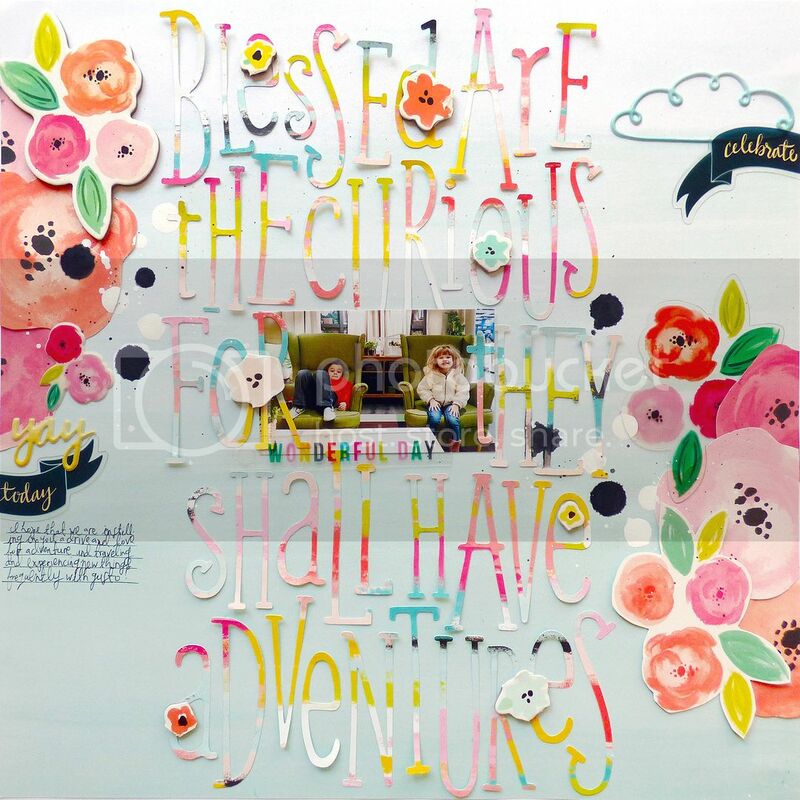 DESCRIPTION: I love these brand new Fanciful Phrases by Kerri Bradford Studio and couldn't wait to cut one of them out with my Cameo! JOURNALING SAYS: I hope that we are instilling in you a drive and love for adventure and traveling and experiencing new things frequently with gusto! HOW TO: Cut the "Blessed are the curious for they shall have adventures" file from paper #12 in Fancy Free and then adhere the letters down the B-side of paper #10. Leave a space for a photo in the center. Fussy cut flowers from paper #7 and layer them on the top left and bottom right edges. Add chipboard, transparency, and puffy sticker flowers over the paper flowers. Sprinkle chipboard flowers (cut apart from one cluster) over the letters. Journal on the left and drop black and white paint across the layout to finish. Love love love love this! LOVING that title and the flowers!!!! GORGEOUS!!!!!!!!!!!!!!!!!!!!! Oh my! This is stunning! Love quotes and you have rocked it here. How adorable is your photo too.